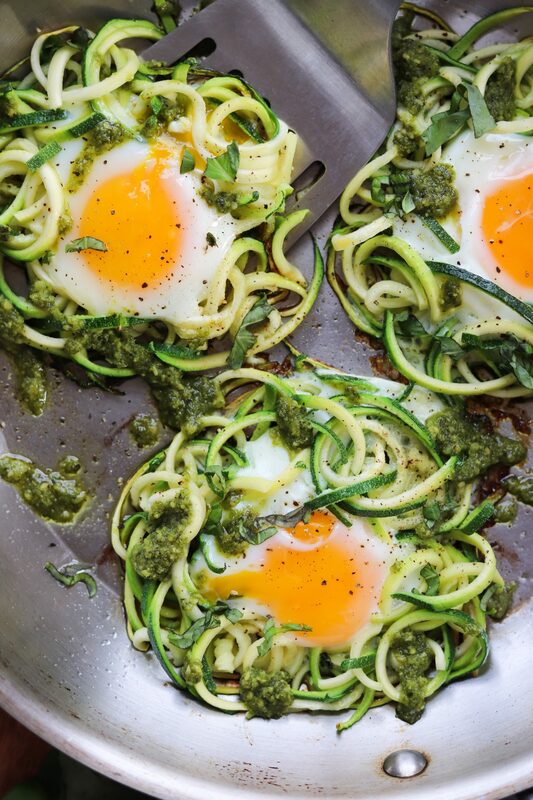 These zucchini noodle and egg nests aren’t complicated or fancy. 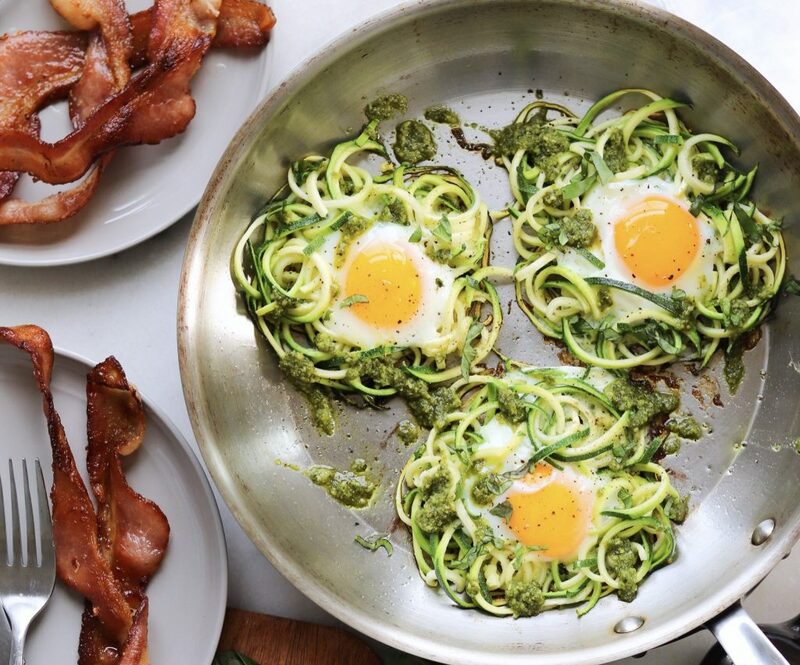 The dish is made in just one skillet, then drizzled with fresh homemade pesto… it’s pretty much a textbook simple breakfast. A few great ingredients cooked right, and I’m filled up and fueled good, plus it tastes unbelievable! And since my kids absolutely love zucchini noodles (they hate zucchini prepared any other way, go figure) they eat with it as much as gusto as I do! I like to make a batch of herby pesto with plenty of fresh basil whenever I get the chance, and it keeps in the fridge for about 2 weeks. We drizzle it on everything for a burst of flavor and a serving of healthy fats. Try my simple gluten free pesto recipe below – and if you’re doing a round of Whole30 or are avoiding dairy, just omit the cheese and give it a good pinch of salt. It’ll still taste amazing! Some pro-tips for making this herby pesto recipe: Use large leaf Italian basil for the most flavor punch. And if you don’t love the harsh bite of raw garlic, blanch the garlic quickly by submerging the peeled cloves in boiling water for about 30 seconds, then transferring them to an ice bath to stop the cooking process. It takes the sting out of the garlic but still leaves you with the delicious flavor! And when you’re ready to make the pesto, be sure to break down the basil fully before you begin adding the olive oil. This allows the flavor of the basil to be more fully released and incorporated into the sauce. Everybody makes zucchini noodles differently, and here I don’t salt and sweat the zucchini before cooking it. Because the zucchini don’t cook long enough in the skillet to release a lot of water, they stay fresh-tasting with good texture this way. 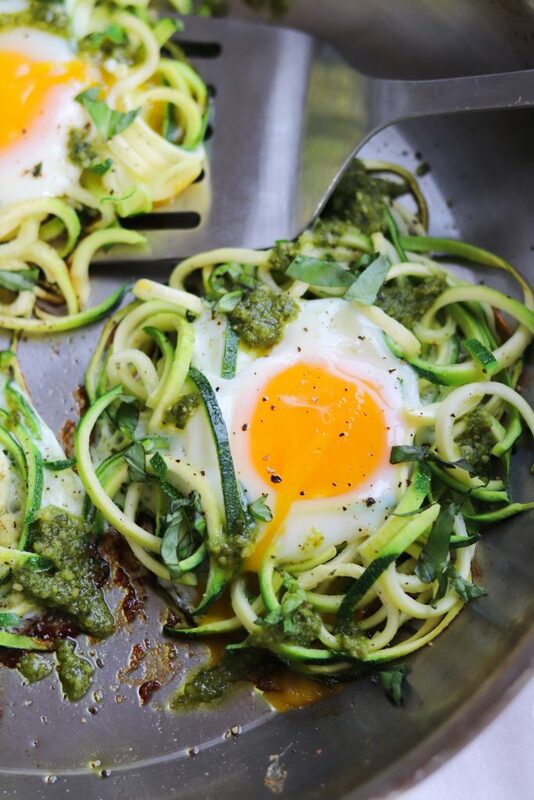 I used Sicilian olive oil for this Herby Pesto Zucchini & Egg skillet creation, and it reminded me of a funny story: I studied abroad in London my sophomore year of college, and one week some friends and I flew to Italy to do all the fun artsy & touristy things. In typical college-kid fashion, we didn’t realize there wasn’t a bus early enough to get us on our early morning flight back to England.. until the very last minute. At 7pm the evening before we were planning to leave, we grabbed our bags out of the crappy hostile and took the last bus of the night to the tiny regional airport. We slept on the floor because they removed the chairs at night… I guess so people don’t sleep on them? I still don’t know why. There was one vending machine that sold sunflower seeds, ONLY sunflower seeds! There was a grungy looking water fountain, though. At 2am they kicked us out because they needed to clean. 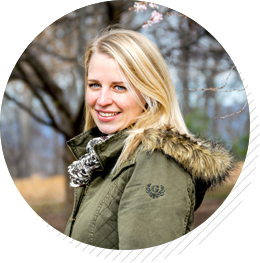 We stood outside, shivering – It was December! Our 6 am flight ended up getting delayed, then delayed again, then delayed again. And again. At 6pm, we were told the plane they’d sent for us was on its way. At 10pm, it was definitely, for sure this time, on its way. Nope. We spent another night in the airport, waiting. If I knew then what I know now, I’d demand some food and drinks, a hotel room, and an apology. Instead, we waited. Tried not to get too angry. Finally at about 5am, they announced our plane was boarding. One friend, the most stoic person I know, began to cry. Just FYI, I’ll never take RyanAir again. You live and you learn, right? 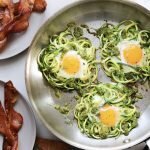 A quick gluten free breakfast made with zucchini noodles, eggs, and fresh pesto. 2 cloves garlic I prefer blanched garlic, but raw works too! In a food processor or blender, add the basil, nuts, lemon juice, garlic, and cheese. Pulse until fully broken down. Turn the food processor to low, and slowly pour in a steady stream of the olive oil until fully combined. Season to taste with salt and pepper. Cut the stem off the zucchini and spiralize on the smallest setting. Roughly chop the pile a few times so the noodles aren’t too long. Heat the olive in a large pan over medium heat. Add the zucchini to the pan and lightly sautée just until softened, about 1 minute. Using a spatula or wooden spoon, separate the zucchini into four round piles on the skillet. Make a small well in the middle of each one. Crack an egg into each well. Cover and cook untouched for about 3 minutes. When the whites are set and the yolks are still runny, they’re ready, but if you prefer your yolks cooked more, break the yolks before you cover the pan. Season lightly with salt and pepper, drizzle with homemade herby pesto, and serve. Looking for more easy & delicious breakfasts? 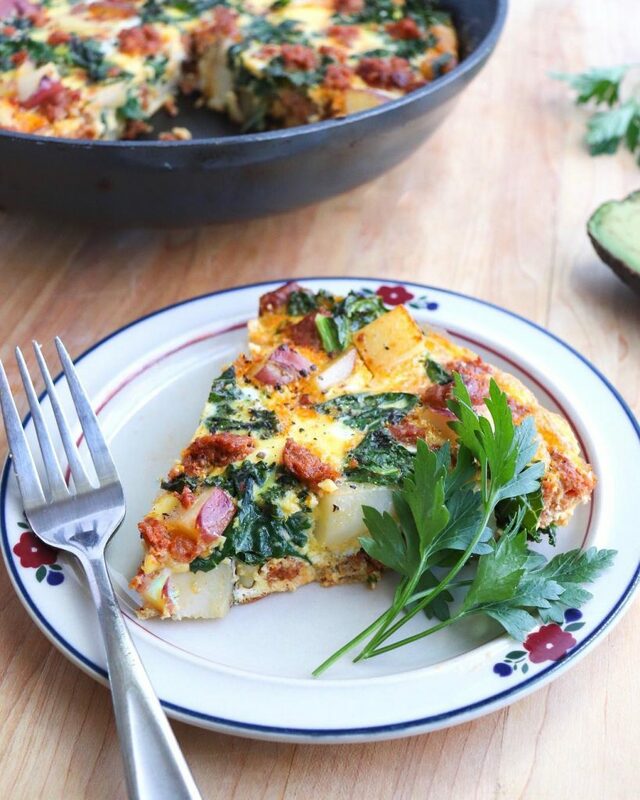 Check out my recipes for Whole30 Shakshuka, Paleo Grain Free Porridge, or this Chorizo, Potato, and Kale Frittata (it’s Whole30)! This looks so delicious! I am definitely going to try! I am on Keto and I’m going to make this! How long does the pesto last? Definitely going to try this, thank you!